Art and Stitch BASE and Art and Stitch PLUS are our flagship products: user-friendly, affordable, vector-based digitizing software for longarm quilters (computer-guided system - Art and Stitch BASE) and machine embroiderers (Art and Stitch PLUS). Please visit http://artandstitch.com/ for more information. Video Tutorials are on our Academy website. Printable books for Art and Stitch Base and Art and Stitch PLUS are included with the software and can be opened via menu Help. Pre-Design Studio is since 2001 our easy-to-use, vector-based drawing software to prepare your own artwork as start for your digitizing software, or to create your own pantos and quilt patterns for longarm quilters. The current (7th) version is Pre-Design Studio IV. Please visit https://pre-designstudio.com for more information. Video Tutorials are on the website and a printable book for Pre-Design Studio is included with the software. QE-Pattern Finder is the latest addition of our software family - in its own way QE-Pattern Finder is making digitizing easier too. With QE-Pattern Finder you can view, search, and organize your embroidery designs, your longarm quilting patterns and your Pre-Design drawings. You can even do some editing and you can add text and monograms. Please visit http://qe-patternfinder.com for more information. 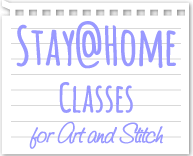 Plan your own Retreat at Home and join our Stay @ Home Classes for Art and Stitch - Each class consists of several lessons, targeting to techniques that belong to each other. When purchasing a Stay @ Home Class you get access to the videos for each lesson, plus a printable class handout describing the techniques shown in the videos and you will get the original designs as well. Please visit https://stayathomeclasses.com/ for more information.